Methyl Red (MR) test determines whether the microbe performs mixed acids fermentation when supplied glucose. Types and proportion of fermentation products produced by anaerobic fermentation of glucose is one of the key taxonomic characteristics which help to differentiate various genera of enteric bacteria. Mixed acid fermentation is one of the two broad patterns, 2-3-butanediol fermentation being another. In mixed acid fermentation, three acids (acetic, lactic and succinic) are formed in significant amounts. The mixed acid pathway gives 4 mol of acidic products (mainly lactic and acetic acid), 1 mol of neutral fermentation product (ethanol), 1 mol of CO2, and 1 mol of H2 per mol of glucose fermented. These large amounts of acid results significant decrease in the pH of the medium below 4.4. This is visualized by using pH indicator, methyl red (p-dimethylaminoaeobenzene-O-carboxylic acid), which is yellow above pH 5.1 and red at pH 4.4. The pH at which methyl red detects acid is considerably lower than the pH for other indicators used in bacteriologic culture media. Thus, to produce a color change, the test organism must produce large quantities of acid from carbohydrate substrate being used. MR Positive: When the culture medium turns red after addition of methyl red, because of a pH at or below 4.4 from the fermentation of glucose. MR Negative: When the culture medium remains yellow, which occurs when less acid is produced (pH is higher) from the fermentation of glucose. MR-VP broth is used for both MR Test and VP test. Only the addition of reagent differs, and both tests are carried out consecutively. Inoculate two tubes containing MR-VP Broth with a pure culture of the microorganisms under investigation. Incubate at 35 °C for up to 4 days. Add about 5 drops of the methyl red indicator solution to the first tube (for Voges-Proskauer test, Barrit’s reagent is added to another tube). A positive reaction is indicated, if the colour of the medium changes to red within a few minutes. The development of a stable red color in the surface of the medium indicates sufficient acid production to lower the pH to 4.4 and constitutes a positive test. 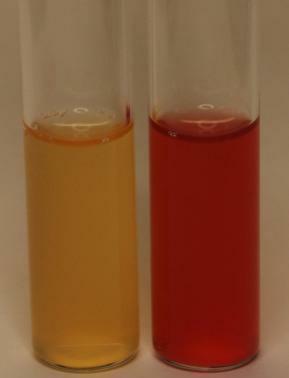 Because other organisms may produce smaller quantities of acid from the test substrate, an intermediate orange color between yellow and red may develop. This does not indicate a positive test. Escherichia coli: MR test positive- appearance of red color after the addition of methyl red reagent. Enterobacter aerogenes: MR test Negative- the lack of color change after the addition of methyl red. BEST METHOD OF SEEKING SOME KNOWLEDGE. Dear Hussein, i suggest you to understand MRVP test. If you understand the test, i think you wont have this question. Im just finishing my last 2 lab reports for my Microbiology class and your blog have been really helpful in helping me understand the underlying principal. Thank you. You work is great.. I am Kenyan student I appreciate your work kudos!! I read in some books, they say we should read MRVP after 48h incubation. Is it legit ? Are the MR and VP results photos switched? is mrvp test is done only for enterobacteriace family members?